England spent his education on science only to turn to religion along the way. That’s pretty unusual, according to the standard social discourse, but I suspect it’s more common than we’d like to let on. There’s no clause in science that says you can’t believe in anything. Even Richard Dawkins has beliefs. Many scientists have been suggesting, of late, that perhaps physics and religion are converging. (Some of us from the other side of the equation have been saying so for years, but who believes a religionist?) Before I’m misunderstood, I’d hasten to add that I don’t mean religion as in literal trumpets sounding as a white horse and rider descend through the atmosphere. Nor do I mean in the sense of the minutiae of the Talmud. What I mean is the symbol systems that religion has long used may have been in some sense in line with what science has been trying to tell us. According to the story, England thinks that matter may be self-organizing. That means life occurs where matter exists. Before I become too close a friend with my sofa I have to remind myself that this doesn’t mean everything’s conscious. Although my reading of Thomas Nagel does have me wondering even about that. You see, religion has historically been one of those disciplines where imagination has had a valued role to play. Those who accuse it of being doctrinaire and evil need to talk to a few more people. Religion has always claimed there’s more to life than what the senses reveal. Science professionally limits itself to the inferences of those senses. And you can get away with paying religion specialists a lot less. What’s not to like about this situation? If the universe is growing, there’s room for us all. Civilization isn’t all it’s cracked up to be. Sure, it’s got its moments—modern medicine, indoor plumbing, Honey Boo Boo—but often it’s artificial. It’s like somebody made up a set of silly rules and those who dare violate them are treasonous barbarians. Over the past few years I’ve been reading books that consider our biological development and what nature seems to indicate about how people might exist more holistically in the world. I don’t mean New Age outlooks, although, surprisingly, such treatments often aren’t far off base. I’d never heard of David Abram or his book The Spell of the Sensuous. (For those who think sensuous means only one thing, the subtitle is Perception and Language in a More-Then-Human World.) Although somewhat dated, this is an insightful book. The basic premise is that we are, by nature, part of a much larger world but we have, like spoiled children, decided to take it all for ourselves and isolate our species from all others, claiming a superiority that none dare challenge. In the process we’ve lost much of what it benefits us being animals, and have separated ourselves from the wonders of the world all around us. Working in Manhattan, I have to agree. Basing his observations on having lived among aboriginal peoples, Abram notes that although anthropologists have denied the tenets of Christian missionaries on the religious front, they have continued in that teaching concerning biases against nature-based belief systems. Peoples who live close to the land observe things which seem superstitious to the “civilized,” but which are, in reality, simply astute realizations based on watching how the world works. 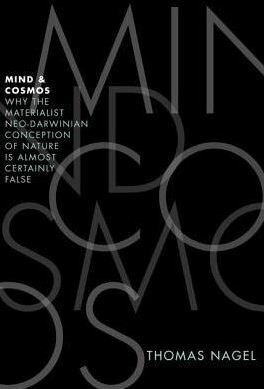 Like Thomas Nagel, he notes that consciousness pervades the natural world. Animals, plants, even the earth itself displays forms of awareness that we ignore in our rush to exploit and gain “wealth.” In reality, we suffer for having made ourselves something we’re not. There’s a lot in this book, far more than a single blog post can say. I don’t agree with all the points Abram makes—that writing may be responsible for our dilemma is a bit of a stretch—but there is great wisdom in this tome. At several points I had to stop and ponder the implications of what he was saying. Yes, nature speaks. Creating a world where “success” is measured in removing yourself as far from nature as possible requires elaborate rules. As far as I can tell, obeying the rules means that if you’re one percent of the one percent you’ll have nothing to complain about. If you have enough money—itself an artificial construct—you can run for president with no other qualifications. Meanwhile, nature suffers at our hands and may only recover once the world is forced from our hands and the sensuous once again takes over, doing what it has always done. Anyone who has looked into the eyes of a cat or dog can have little doubt that they think. What exactly they think is, of course, a matter of conjecture. 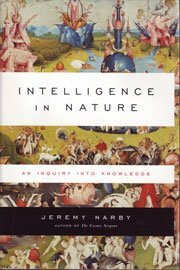 I had been meaning to read Jeremy Narby’s Intelligence in Nature for a few years now. We are taught at a young age to eschew anthropomorphism—although our eschewers don’t use that word—as the childish way of perceiving the world. Animals don’t think because that’s reserved for people. We sit in the finest spots in the poshest corners of the animal kingdom and the sign says “No Dogs Allowed.” I never really outgrew this child-like belief because the minimal scientific evidence I’ve been able to infer supports the idea that like us, other animals think. Narby, an anthropologist, agrees. At least to a point. I don’t wish to make claims for Dr. Narby that he wouldn’t support, but he provides fascinating empirical evidence, “down” to the level of amebas and plants, that indicates intentionality. Nature is alive with thought. As an anthropologist, Narby begins his consideration with the insights of shamans. Although scientists rarely countenance shamans, they are among the earliest of human religious specialists and they have long promoted the idea that humans are fully integrated into nature. We are not separate and above. From our brains to our bones, we are one with the natural world. If we think, should not animals think? Interestingly, this idea brings Narby into some of the same territory as Thomas Nagel; intelligence may be a cumulative process. Our brains’ ability to think may be the result of collecting together the thought processes of our fellow creatures to a point where our thinking becomes abstract. We’re told that dolphins and whales don’t think like us—they don’t build cities, do they? Maybe it’s because they didn’t evolve opposable thumbs. Maybe it’s because they’re smarter than we are. There are, it seems, many thinkers on the outside of the hallowed confines of hard science that are chipping away at the strict materialist edifice. There can be no serious question that the empirical method explains much of what we experience in the universe. It has always amazed me, however, that we assume that humans are able to find the outer limits of existence with our limited senses. We know animals can see, hear, smell, taste, and maybe even feel in ways beyond our capabilities. Who’s to say that there isn’t other input well beyond our limited senses that we use to survive in this environment? After all, we didn’t evolve to know everything—we evolved to be able to thrive in our ecosystems. For that you don’t need all the answers—just enough to get by. If you doubt my reasoning here, I suggest you ask your dog or cat.